The Georgia residency of freshman Democratic congresswoman Lucy McBath is again in question after tax documents were revealed showing Cobb County does not recognize her family's local home as a permanent residence and has revoked the homestead exemptions that were granted. McBath was a first-time candidate for Georgia's sixth district and was criticized by her Republican opponent Karen Handel for living in Tennessee when she decided she would run. McBath voted in Tennessee during the 2016 election cycle. Handel questioned how her husband, a permanent Tennessee resident, was claiming a homestead exemption in Cobb County when he lived in a different state. "Now y’all, I’m just a former county commission chairman," Handel said. "But I thought taking a homestead exemption here while claiming permanent residency there was a pretty big no-no." McBath called the critique "baseless" during the campaign, but it now seems Cobb County has sided with Handel. Cobb County allows residents to lower their property tax liability through a homestead exemption to residents claiming a permanent residence in the county. McBath's husband has taken the homestead exemption since 2000, but has now been ordered to pay back-taxes for the last three years, according to documents obtained by AllOnGeorgia.com. The documents from the Cobb County Tax Commissioner’s office show an audit was performed after allegations were made that the McBaths were misusing the homestead exemption. The findings of the audit were that the McBaths did not qualify for the homestead exemption from 2015 through 2018, the year McBath was running for office. It cited vehicle registrations, voter registrations, and driver's license applications in other states. Cobb County is only able to audit tax filings going back three years, so it is unclear whether the same tax issues existed in previous years. It is also unclear whether the McBaths have established permanent residence in Georgia this year, and whether they intend to ask for the homestead exemption. A spokesman for McBath said her campaign "disputes" questions about her residency, pointing to her many years in Georgia before moving to Tennessee. The statement, which can be read in full below, does not address the tax issues, and her campaign did not respond to follow up questions. "The facts are that Lucy moved to Georgia in 1990, while Karen Handel was still living in DC," the campaign said in an emailed statement. "Lucy raised her son, Jordan, in the sixth district. He attended Marietta High School. Lucy has lived in her home in Marietta in the Sixth District since 2008. During the 2016 presidential cycle, when Lucy was traveling extensively and for family matters, she briefly changed her residency to Tennessee. Because of her ties to her Marietta neighborhood, she chose to return her residency back to Marietta and renewed her voter registration. Lucy voted for herself last year on May 22, July 24, and also on Election Day when she defeated Karen Handel. She plans to vote for herself again, on Election Day of 2020, when voters of Georgia Sixth send Lucy back to Washington." Republicans are using the tax documents to label McBath "Tennessee Lucy" and argue she "has no business representing Georgians in Congress." 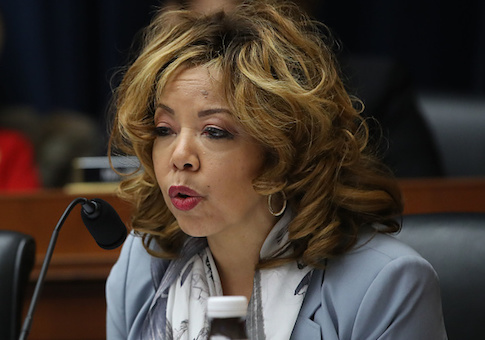 "Lucy McBath is a resident of Tennessee, not Georgia, and she has no business representing Georgians in Congress," said the National Republican Congressional Committee. "Unfortunately for Tennessee Lucy, her scheme has been exposed and real Georgians will not think kindly of an out-of-state liar representing them in Congress." Handel, who represented the district for one truncated term after winning a special election, has reportedly been considering running to regain her seat. She defeated Democrat Jon Ossoff in a special election. Ossoff also did not live in Georgia's sixth district when he was a candidate.